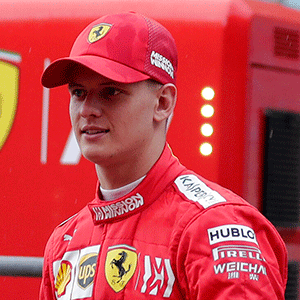 Berlin - Mick Schumacher, the son of seven-time Formula One world champion Michael Schumacher, said his test with Ferrari this week was an important stepping stone in his fledgling racing career. "It was very emotional, not just for me, but for all those who were there," the 20-year-old Schumacher told AFP subsidiary SID on Friday. "There are doors which open. It gives me opportunities to work with the Ferrari F1 engineers at Maranello. I can learn very important things there for my future, and that I can already use in F2." On Tuesday, European Formula 3 champion Schumacher, who is taking part in the Formula 2 championship this season, drove 56 laps for Ferrari at Bahrain's Sakhir circuit. "I've been very direct and very open in my feedback that I gave, to show where I still saw potential for improvement," said Schumacher, whose father won five world titles with Ferrari. "Even if it's difficult, as you still don't properly know the car and you don't yet know where your limits are. The speed in the turn is really fascinating, the car moves as if on rails." Following two seasons in F4 and then F3, Schumacher said he didn't have any particular timetable for a move into the top category. "I raced my first weekend in F2, now I'm going to see how it goes. I've done a test in F1, but for the moment I'm completely focused on F2," he added.